I have been an avid cyclist for a long time now. Like, fifteen years. And since I’ve been saying “I’ve been an avid cyclist for fifteen years” for about three years, it’s possible I’ve been riding even longer than fifteen years. I’ll get back to you once I’ve done the math. Anyway, during my long and increasingly illustrious cycling career, I have learned many, many important things about riding. Things I wish I had known much earlier. Things you may not know. Enough things to fill a book. As long as it’s a really short book. Or if I’m allowed to use lots of illustrations and a big font. OK, the fact is there are three things I have learned that I think are worth sharing. It’s entirely possible that my three hard-earned epiphanies may do someone some good. Not probable, perhaps, but you must admit: it’s possible. My head spins now, even thinking about that. 50psi. Fifty pounds per square inch. No wonder I was the worst, most squirrelly downhiller that ever lived. Nowadays, I have big wheels — 29″ instead of the 26″ variety — and I ride with a Stans NoTube setup. And I ride with my tires at 20 – 22psi. Maybe 25 if I’m racing. There is nothing — nothing! — that has affected my riding (and especially downhilling) so dramatically as this change. I corner better. Even fully rigid, I bounce around less. I just feel like I am in much better control. And I’m pretty sure I flat less, too. Now, I’m pretty sure that not everyone has had this low-pressure epiphany. A couple weeks ago I started a ride with someone who was inflating his tires to 40psi. “I am about to make you a much better rider,” I said, and let half the air out of his tires. And this guy — for the first time in his life — suddenly found that he loved descending Mud Springs and Tibble, trails he had no affection for at all previously. And for a moment, I knew exactly what it felt like to be Obi-Wan. Or Mr. Miyagi. The next big thing that — up until last year, really — slowed me down on the downhills was the certainty that going slow is safer. That when I got to a nasty downhill field of loose softball-sized boulders and deep dirt the consistency of talcum powder (those of you who have ridden the section right after Julie Andrews Meadow on the Timpooneke trail know exactly what I’m talking about), the best policy is to inch my way down, treating each rock as an individual obstacle to be evaluated and (if at all possible) circumvented. 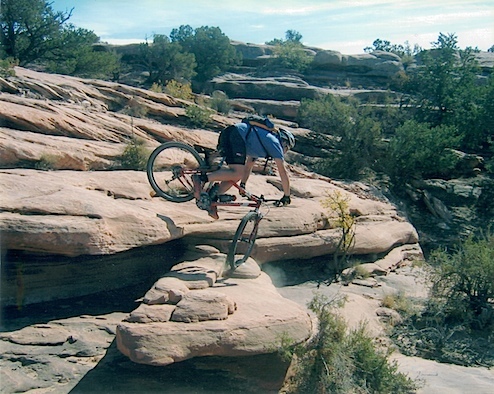 And then my front wheel would inevitable jam against a rock and I would endo. Dan was right. When your wheels are rolling fast, they go over stuff they get stuck on when you’re going slow. When your wheels are spinning fast, they want to stay upright. And when you’re going fast, you don’t have as much time to fret. Perhaps the strongest case in point of this fact is this (incredibly awesome) picture of me. If I hadn’t grabbed a handful of brake, if I had just sailed the move the way everyone else in the group had, probably all my weight wouldn’t have gone onto that tire, making it explode and then slamming me into the ground. Today I could ride that move easily. If I were to try it. Which I’m not. Because I don’t believe I will ever be able to get this image out of my head. I used to wear a Camelbak for every single ride. Even rides that lasted just a couple hours. But here’s the thing: if you’re wearing a Camelbak, standing climbing is a pain. And if you’re wearing a Camelbak, you’re top-heavy. And if you’re wearing a Camelbak, your back stays all sweaty. And don’t start in about mesh this and wicking that. A big heavy backpack makes your back sweat. But that’s not the real reason to not use a Camelbak. The real reason to not use a Camelbak is because — if you’re going to be out for less than four hours — bottles are generally all you need. And they’re right there on your bike. Although — not very ironically, but maybe a little — the very best bottles do in fact seem to be…Camelbaks. Yeah, I expect to get some disagreement on this piece of advice — a backpack holds a lot of food and gear, and a lot of bikes don’t have room on the frame for two bottle cages. But this is my distilled wisdom. And I ride a singlespeed most of the time, and am standing up when I climb. Which means a Camelbak feels like it’s trying to wrestle me to the ground as I row my bike up the mountain. But with bottles, I forget they’re even there ’til I need them. So. There you go. Fifteen years of wisdom. All in a nice one-sitting read.